D. A. Thompson began his military career as an ROTC student in 1937 at Texas Tech College. He was commissioned a second lieutenant in November 1941 and called to active duty in February 1942. He was assigned as company commander in the 75th Infantry Division where he remained throughout the duration of the war. When discharged from active duty in 1945, he was the battalion executive officer of the 275th Engineer Battalion. After World War II, Brigadier General Thompson joined the 49th Armored Division. He was S-3 and executive officer of the 145th Tank Battalion, commanding officer of the 5th Reconnaissance Squadron and 1st Infantry Battalion. While assigned to the 49th Armored Division he served as commanding officer of the 49th Armored Division Trains, and Combat Command B, 49th Armored Division, which was later reorganized as the 3d Brigade, 49th Armored Division. In October 1966, he was assigned as assistant division commander of the 49th Armored Division and promoted to brigadier general. In January 1968, the 49th Armored Division was reorganized into the 72d Infantry Brigade and General Thompson was assigned as the brigade commander. 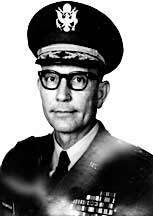 In April 1970, General Thompson was assigned as deputy commander of Base Units Command. He retired on April 15, 1976.